In the foreground are the ruins of Portslade's Norman Manor House. The above entry, is a facsimile of the opening page of the Parish Registers of St Nicolas Church Portslade now held in the East Sussex Record Office, which states that the pre 1666 Portslade Parish Registers were destroyed in a fire. 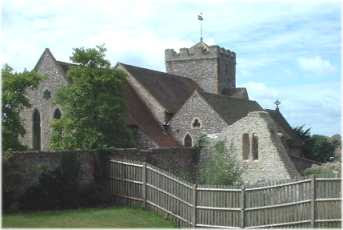 The Vicars of Portslade also served as Rectors of the neighbouring village church of St Helen, Hangleton, from 1523-1955. St Nicolas (Portslade) churchyard was closed for burials in 1872, for information of burials before this date contact The East Sussex Record Office who now hold all of St Nicolas Portslade's burial records. A list of all legible inscriptions on gravestone monuments and a map of the Churchyard of St Nicolas Church Portslade can be found at the "Hove & Portslade in the Past (St Nicolas churchyard)" website page. For a list of all memorial inscriptions inside St Nicolas Portslade see the "Hove & Portslade in the Past (Memorial Inscriptions)" website page. The Church of The Good Shepherd Mile Oak (built in 1967) does not have a churchyard for burials. St Andrew's Portslade (built in 1864) does not have a churchyard for burials. Portslade Cemetery, Victoria Road, Portslade, was opened for burials in 1872, contact theBrighton & Hove City Council for information of Portslade burials after this date.